Who says Vaseline is boring? Simple? Yes. Classic? Always. Cheap-as-chips and value for money? Absolutely. Boring? NEVER. And to underscore that point, the fifth limited edition of it’s cult status Lip Therapy comes dressed in striking black and gold, with a delicate rose, vanilla and red berry flavour as an added bonus. 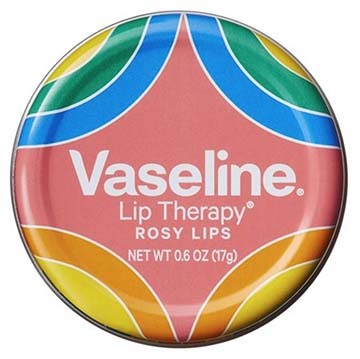 Called Vaseline Rosy Lips, it’s available to dress up your day till stocks last. Want it much? You’ll have to run – not merely walk – as this one’s already selling out worldwide! Incidentally, Vaseline is such a diverse product that you can use it for a whole range of things. You will see big tubs at literally every fashion week, photo shoot, red carpet event, dermatologist’s office and hair salon, hiding in plain sight. Here are some of my favourite ways of working it, gleaned from picking the brains of leading beauty professionals over many, many years. 1. Vaseline as eye makeup remover: A dab of Vaseline can remove even the most stubborn mascara while soothing the eye area – just massage it in gently and wash off with warm water. 2. Vaseline as body scrub: Vaseline mixed with a handful of sea salt (or sand, if you are on the beach and want to make like the Brazilians) works as a great exfoliator. 3. Vaseline as lip scrub: Apply a thick layer of Vaseline to your lips and let it sit for 5-10 minutes. Then scrub it off with an old (gentle) toothbrush for fabulously soft and smooth lips. Re-apply a thin layer to seal in moisture. 4. Vaseline as manicure mender: Dabbing a bit of Vaseline on the base of your nails will stop the colour from running onto the fingers. 5. Vaseline for shaving: Run out of shaving cream? Apply a thin layer of Vaseline and then shave. Don’t use water and remember to keep rinsing the razor as you go. It can be slightly greasy but will leave you with superbly soft and smooth skin. 6. Vaseline as highlighter: Professional makeup artists do this all the time, especially during catwalk shows – apply a very thin layer of Vaseline on cheeks and under the eyes for that dewy look. 7. Vaseline as cream blusher: Want a rosy flush? Mix vaseline with your lipstick to make your own cream blusher. 8. Vaseline as fragrance fixer: Applying a thin layer of vaseline on your wrist (and other pulse points) before spraying on perfume will make the scent last much longer. 9. Vaseline to protect skin from hair dye: Every hair colourist worth their name knows this one – you need to apply a layer of Vaseline around the hairline before colouring your hair. This not only prevents stains but also protects skin from the harsh chemicals in the dye. 10. Vaseline to seal split ends: While nothing can mend split ends, rubbing in some Vaseline can temporarily seal them, creating the illusion of sleek, damage-free hair. Did you know that the first ever Vaseline Lip Therapy limited edition – Crème Brûlée, launched in 2011 – was the fastest selling product in Selfridges’ entire history? Rub Vaseline into dry feet , and put on a pair of fuzzy socks before bed. You ll wake up with much softer feet!